Emily Driscoll (22) and her retired racer Quincy (6) were hit and killed by a car on Sunday night near Chicago. You have come through for the galgos in multiple ways! 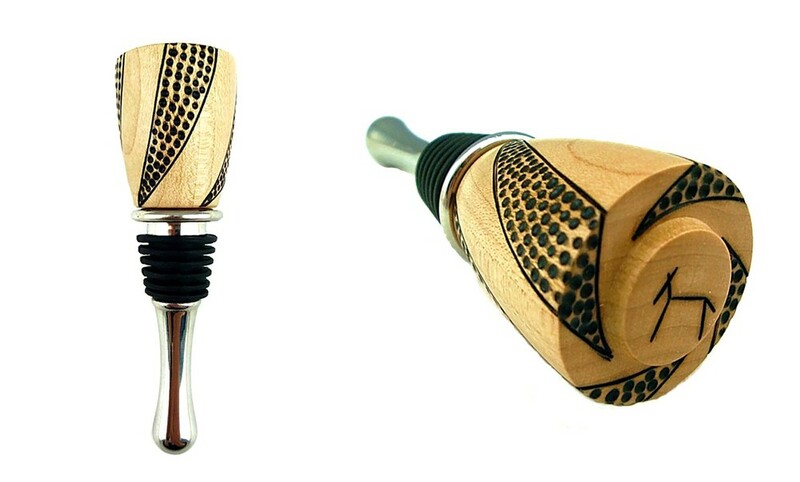 We raised $6,854 in the recent GRIN auction hosted by 2 Hounds Designs! Those funds will allow us to support the shelters in Spain with grants to cover veterinary and other expenses as well as provide supplies! 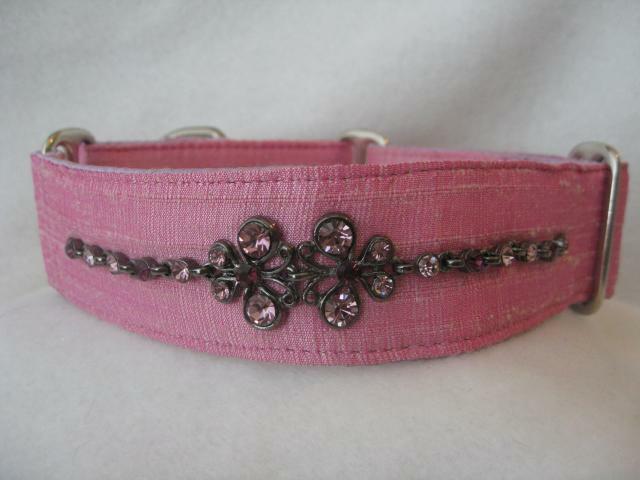 These funds will also be used to ship coats, collars, and leashes to the shelters. The donation bin at Dewey hosted by Beth Wade Designs yielded 110 leashes, 205 collars, 56 coats and 10 harnesses! Thank you again for your amazing support for these recent activities — it is all about the dogs! GRIN Auction at 2 Hounds Design is now live! unique, handmade goodies for you, your home, and — of course — your hound(s), you're sure to find something you can't live without. All proceeds go to the Galgos, Podencos, and other sighthounds and hounds that desperately need your help. Please check out the auction on October 6th and let your friends and loved ones know it's going on! A huge thank you to 2 Hounds Design for making it possible and to you in advance for your support! FALL TRANSPORT KICKOFF FOR 2013! GRIN is happy to announce that in less than one week, we will begin our anticipated 12 Fall Transports from Sept 23 to Nov 18 that will bring a total of 36 lucky galgos and podencos to the USA! We have been so fortunate to continue to work with our friends in Spain and our friends here in the US to accomplish this amazing feat. Thanks to the following Spanish charities for continuing your work and for helping us help the plight of the Galgos and Podencos in Spain. This Fall we are bringing dogs from : Galgos en Familia, Galgos del Sol, Ibizan Hound Rescue, 112 Carlota Galgos, Asssoc. Protectora Argos, Little Pod Foundation and one with the help of Maria Caseres. GRIN also is happy to announce that several Greyhound groups in the US are now working with GRIN to rescue a few galgos and podencos and bring them into their existing groups twice a year. Thanks to Grateful Greyhounds of NY, Forever Homes NY, Greyhound Rescue and Rehab NY, Fast Friends Greyhound Rescue NH, Grateful Hearts PA, and Greyhound Companions of New Mexico. Also a big thank you to the Lexus Project for their generous financial donations that have provided a way for many of these hounds to find a new life here in the states. They have made a huge difference in the numbers we have been able to bring!! Also a big thank you to all our air patrons this Fall, some being veterans of international dog transport, and some first time helpers! We are so thankful that so many are willing to be the link that helps us bring the dogs home!! Marylou Hecht, Sharron Thomas, Cameron Lesko, Telma Shaw, Lisa Swartz, Sara Young, Lisa Lebeau, Don Baldwin, Amy Kahn and her son, Bernadette Koh, Noreen Richards, Lisa Schwartz, Zoe Moran, Raul Saez Pagan, Richard Rosenthal and Britta Betzin. All of you wonderful folks thank you for braving the airports, the travel and a little bit of stress, as well as your commitment to this wonderful endeavor! And last but not least, thank you to our wonderful adopters who have opened their homes and hearts once again to the less fortunate hounds in Spain..We love you all!! And the dogs love you too!! We are now expecting that things go as planned knowing that sometimes unexpected situations arise, but we hope with all our hearts that the dogs will be safe and our helpers safe and that all goes according to plans!!! Paws crossed and we will be updating each transport as it comes in on our Face Book page..Thank you everyone and here we go!!! Mil Gracias ah todos! We are happy to let our supporters know that GRIN has been able to distribute thousands of dollars from our Shelter Aid grants and from our Emergency Assistance Fund to the following shelters in the last four months. Your tax deductible donations are so appreciated as it is helping these hard working associations in Spain care for, rehabilitate and provide emergency care as needed. Thank you for continuing to believe in and help the plight of the galgos and podencos in Spain. Our mission is to continue to help the shelters that need us. Thank You so much and take a peek at some of the dogs that have been recipients of your support! THANK YOU FAITHFUL GALGO AND PODENCO LOVERS FOR YOUR CONTINUED SUPPORT...WE CONTINUE OUR WORK WITH YOUR HELP! It was a Wednesday afternoon and I was ready to meet Char once again and ride with her to the vet. We had a very special boy with us..yes Ebro was on his way to be finally be sterilized after all the months of recuperation from surgeries of his front legs. Anyone who has followed the posting on FB about 112carlotagalgos knows the story of Ebro and I was so excited to meet this brave survivor! 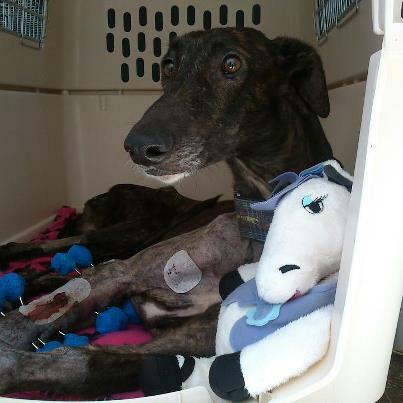 He like many galgos suffered at the hands of hunters who thought nothing of breaking both his legs and discarding him..they thought that was the end, but no, he survived and fought for his life. People from around the world rallied around him and raised money for his surgeries and by a miracle Ebro is now able to stand and walk although wobbly but each day a bit stronger. I must admit that I was overjoyed to finally throw my arms around him and tell him how much we all cared for him. It was one of those moments that is etched in your heart that you can’t forget..his strength, his sweetness, his endearing nature..Ebro what a champ you are! UPDATE 6/3/2013 all pins removed from Ebros legs!! He's walking! We left Ebro and went to pick up the kids at school..much to my dismay we came across a nice looking galgo that is brought to the school daily, tied to a rail while mom goes to pick up her kids..oh nooooo….anyone can steal this boy! A friendly well cared for fuzzy galgo..Char is trying to find out who the mom is to have a bit of a chat with her about galgo thievery..that was hard to walk away from. We picked up Ebro and drove to the Finca (in Spanish that means a small farm/ranch) that 112carlotagalgos calls home. I had visited the finca in Oct. when they were in negotiations to rent it and now I was going to witness the transformation. I must say I was so impressed by the work the del Rio family had done to make the shelter so inviting for the galgos in their care. Nicely arranged mini casas for groups of galgos and pods in the midst of an orchard, on a hillside overlooking the countryside..so peaceful and healing for the poor galgos who come there so traumatized..it is what is needed and with the help of a few volunteers the dogs are well taken care of and happy and content as was I. I must say I so enjoyed my “duties” giving the galgos baths, some their first baths of their lives with shampoo! I was in galgo heaven! The galgos and pods spend their day sunning, playing and snoozing either outside on their dog beds under a tree, or inside their casitas. Their choice! I spent lots of time just sitting and letting whoever wanted love to come over to me and that was the best part of being there. Connecting with these sweet souls who luckily were now at the finca waiting for the next part of their journey. There is one word to describe life at the finca..action! The del Rios live on the property with their three children, their own two galgos, Ebro who is recovering, a ranch dog Niebla who guards the home and ranch, a tiny pod named Belen and a beautiful horse named Bailey and two cats. From time to time other galgos start their life in the home area to get accustomed to people before being integrated into the pack in the orchard. When I was there little Emily a frightened little galga who had been ripped from her pups, had mastitis as well as filarial had just been brought to the finca. She screamed and wined constantly for two days..while I was there I took her under my wing and took her on mini walks on the patio petting her so she would know life was just getting better..little by little she was calming down..I hear she is finally able to mix with the larger group of dogs..that is what the finca is about..rehabiliation. Another really fun activity that the galgos need is the pack walk. Char, Susanna and I took a group of 6 or 7 dogs at a time and walked the beautiful windy country paths with the dogs. It is good training as every other finca in the neighborhood had dogs charging the walls and gates barking and carring on as we walked by. Good method to work with the galgos to learn manners! As dusk approached, time to feed the dogs, shake out bedding, fluff the pillows and give meds began. Lots of playing was going on with all the new toys I had brought the podencos! The galgos spend their days learning a routine to get them ready for home life. Up until now, many were left abandoned fighting for their lives and their next meal. Many hovelled together in dark sheds, many hurt, sick and injured..here at the finca those memories begin to fade, and soon their wonderful personalities begin to flourish. That is what is so up lifting visiting our shelter friends..We see the transformation of these beautiful creatures. They are so full of love and life and thankfulness..you just feel THE LOVE! I also met some amazing friends of 112carlotagalgos who drop by to help Char with many of the chores around the kennel. Once done we took a break and had a nice lunch “a la fresco” outside in the patio. No lack of house dogs doing what they do best, begging! I want to thank our GRIN supporters for the donations I received to take to the shelters I visited. To 112carlotagalgos the greyhound rescue group Leaving Tracks in GA donated for this cache of food for the dogs! It was so welcomed! ..and for the other donations of goods I was happy to bring two suitcases chocked full of supplies! Thank you everyone, April Lamb, Asa Barbani, Dr. Herman and all our GRIN supporters!! The time wizzes by so fast and my time with the 112 hounds left me energized and happy to have been there to spend the time with friends both two legged and four! Part III follows as I leave Malaga and begin the journey home with two galgos on their way to the USA..stay tuned..
We know you will inspired by this amazing story of survival and courage. We thank Char del Rio for sharing with us and for all she has done for Ebro. Simply wonderful. Dear Ebro, I watched you come to us, in complete destruction, your body shattered with wounds, your soul empty and internal damage with which we had no idea if you would overcome. I looked in your eyes, and I swear I saw you ask me "just what am I even doing here?" Pierced my soul right to my core, and I felt like I was shattered just looking at you. Trying for you not to see that, I then reached over to your best friend, your companion in trauma, and saw her tiny frame, her beaten down look, and wondered what on earth had happened? You couldnt answer, Jade, couldnt answer but I knew I would do all we could for you. if nothing else remove your pain and physical agony. I caressed your head but I couldnt promise, for i didnt know if you would make it or not. But I said to you whispering, if you hold on, if you fight, Ill fight with you, for you all the way home. I left you in the hands of Paco, all of us blown away with what we had seen. Sheer destruction of two bodies, and empty souls. It would be so hard to even contemplate to wonder, what you were feeling, or thinking. The following days passed by and I was scared to call Paco, to see if you were still there. If Jadey was still there. Those days led into weeks, of putting you back together like a puzzle. Only tackling bits of you - parts of you when you were ready for the next stage. If you made it through that. We lost Jade as the weeks went by, and shattered what felt like the world. You both, rocked the universe, found friends you have met, will meet and may not meet, but they carry you in their hearts as i carry them in mine, friends I never knew I had but have now found ... and everday I promised to show you why, just why you hung on Jades passing was hard, it hit us all and wounded our souls. She lives through you Ebro, around you and in us all. One galga who went through hell, but ended up in heaven. My only comfort was she went peacefully, gracefully, in my arms like the peaceful creature she was. I think of her everyday, no matter where I go from here, where we go.. there will ALWAYS be a Jades house as part of 112 carlota Galgos and the del Rio family. One day, you will gain enough strength to walk down to the Orchard and see Jades house, all for yourself. So the weeks became months and you did come home, what a day that was. Scooped in a Carrefour shopping bag we had invented a type carrier for you. Did I ever wonder at times, if it was right for you the struggle? Ya know, I dont think I did. I kept my head down and cared for you. Praying you through it, night and day. You wont remember, or will you.. but the endless nights, the screaming and crying of fear and pain. But I do! We all do! The nights faded into dawn and the coffee pot would go on superrrrrrr early, up with the lark I would say. Id sit with you on the end of the sofá, you knew I was there, head bowed falling asleep in the same position my hand lowered onto your head.. The catching of poop into nappies, the cleaning of piddle and baths when you were wet, just so you would feel clean and fresh. There was no need to smell poopie, only rose scents would do for you! The carrying of you like a baby, the cleaning of such wounds, you wont remember will you.. and even I will forget the intensity. You were so trusting, you let me cure your wounds, touching onto the bone where i could see right through your leg to the other side. The back stabbing wounds on you.. to which this day you are scarred, no fur seems to grow back there, these are the marks you were granted by your attacker, and they wont fade. They wont disappear, they remain prominent, but healed. The weeks into months and here we are!!! Who would have reckoned it.. the pressure on for you to stay with us, it was always my intention to find you a forever, if you got that far. Until I really began to realise, the whole picture. Allowed myself to feel and not just do. For slowly I guess, I was falling for you. Your charm and personality coming through, well who wouldnt, you had most of the world in love with you. Your new friends showered you with gifts. Id never ever seen so many gestured, certainly never ever been on the receiving end of such beauty and such giving. To open these gifts for you, made me speechless at times. Beds, toys, neck supports, all sorts. Then I found by a donation your fave treats! BOY was that a revelation, it gave me a few hours sleep. Then a few more.. felt like a child sleeping through the night after the first years of babyhood. The donations that have helped you recover, blew me away. I didnt even think in the beginning about numbers, that night when I stood by your side, seeing you and jade all stapled up, and a blue bandage on you. I didnt think numbers, I saw chances. We progressed to you sitting up and us trying to stop you. An amazing moment and hard to try to get you to sit when all you wanted to do was get up! After soooo long lying down. Then you would turn and try to put weight on your back legs.. hips still recovering we still could not let you. The tremendous fear you felt outside, the trembling,.. the panic tore through me and ripped me apart at your pain. How I wondered what your attacker looked like! I wonder if he will ever feel that panic. ? On Pacos ok, you could sit up, then walk. Well.. the day you walked, took my breath away. Mass achievement which made the world dance. You were never alone Ebro.. everyone has been with you. Mother cells donated from the University of Malaga led to investigative work, you were a good candidate for such a trial. Im sorry to say! However, it did its job and thats what we wanted for you. Eventually the first pins came off one leg. A new leg was born!!!!!! Bent, waddling, but new. No pins, no bandages, no more nappies, no binding. FREE LEG! On reléase well, your specialist said to me, "he will never be a runner!" But hes on his feet. A miracle. Over the last few days I saw a light go on, youve changed sweet Ebro. Mentally we still have some way to go, but we go together. its a challenge we take paw in hand. Me, you, and everyone. Today,.. well to be honest, I thought Id seen it all. All you had to give. Until, we were all outside, me the pack.. Ambo, Clara, Suri, Belen, and Emily. Wandering down to the galgos. Only to note a went nose on my hand. A small yap and I knew. I know your cries Ebro.. each and every one. I looked down and there you were in the midstof the gang. Part of them. No longer an outsider with a disability, but sanwiched between. Calling me to see you. I looked down and spoke, giddely, the way I do when encouraging you. Saying " Ebro whatcha doin" Well, ... you took my breath away, you wiggled, you pranced, toy leapt, played with the others and then ran! Yes Ebro, I think you felt so happy you didnt even know. But you RAN! It was a momentary Split second and i couldnt video this moment, but I know ALL your friends have wanted to see this moment, hear about it, and so here I am, more proud I could not be. Ebro, dear Ebro. This is it for you, thanks to so many kind people, kind friends, you have been cared for, loved, and made better. Such amazing people who love you dearly, and I can only tell you about it. Some you have met, some you will, and some you may never, but I will always talk to you about them, their gifts of life to you. You have so many mamas and papas, and thats the reason why you have found your forever. Part of 112 Carlota galgos, you will always be. I hope that forever I can attend your needs, for as long as your life takes you, I will work for you, for your siblings in this country which havent made it, that will make it and that still await the kind hand of courage to come in and rescue them. It would be far too hard to find a mama and papa for you, because there are so many that adore you and love you, how could I do that? So heres the deal, here you will stay but continue to have mamas and papas across the world. They love you Ebro and you are one galgo to whom some can be a part of, to whome you can continue to be in their life. if they never get the chance to adopta a galgo Español, they have you dear Ebro being a part of them. Showing them just why we do what we do, why they do what they do, showing the world just how we cannot do much without their help, and showing them just what can be done with their help!! My initial thought when entering into the plight of galgos was.. "one multiplied by many, becomes a forcé to be reckoned with!" Mr.Ebs, we all belong to you. You are a fighter and a winner. You are a miracle. A living, walking and now running Miracle. So lets look to the next stage now Ebs.. MONDAY! The FINAL PINS COME OUT! The week later "I think" the final Mother cells go into the leg. This pending..
Monday.. at ten am, as Ebro wanders into surgery please lets light a candle for Jade. I am sure she gave him her last strength, she fought for him and he fought for her. She watches over us all. with wings like eagles she wraps us up, lets us down, and graces us with strength. You have taught me one thing Ebro.. when strong isnt good enough... BE STRONGER! For that I will be eternally greatful, a lesson I can pass on to others. So heres to that Ebs! Heres to teaching the Young, heres to change, and heres to you! A new dawn, a new day! With all my love and respect.. Charl. "May you the galgo, rise back up in society and become the household pet, you so deserve to be!" Ebro you are a shining your courage your strength to survive inspires all your friends who love you so much. April 25 - May 5, 2013. I spent 10 days in southern Spain, Malaga area, to visit two of the shelters that GRIN supports and to bring back yet two more wonderful Galgos to the U.S. It was once again an amazing trip and wonderful time seeing my friends and coming along with them on their day to day rescue work. As usual, it was a whirlwind of activity. Right off the plane I was met by Vera Thorenaar of Galgos en Family www.galgosenfamilia.org who recently moved into a new shelter building a few months ago after two years at the one I visited last fall. The new shelter is great as it has everything needed. Inside outside kennels, quarantine area, grooming bathing area, large turnout area and even a washing machine! She has a dedicated group of volunteers who have morning and evening duties each day and lots of time is spent with the Galgos socializing..what a great setup for rescue work! 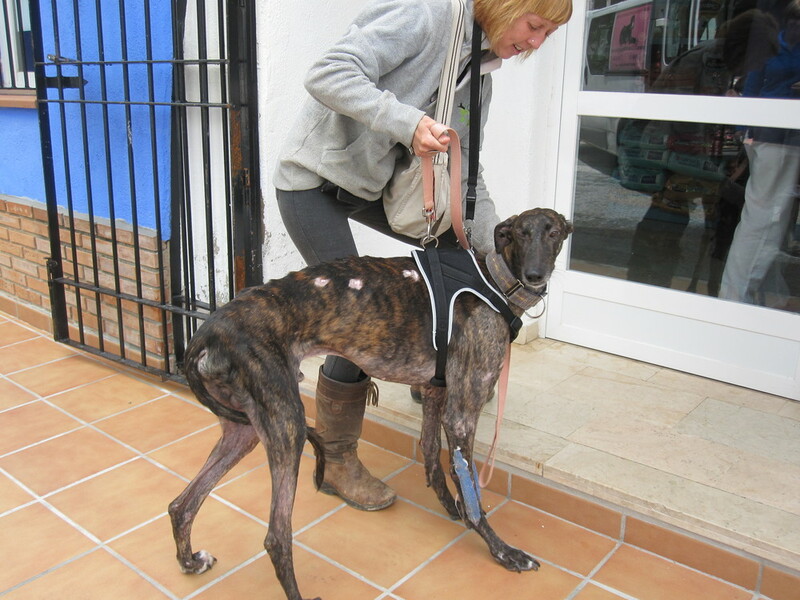 My first day in Spain we went to pick up a poor galgo who unfortunately was fighting for his life due to illness as he had been on the streets in a lamentable condition for many months. He was at the vets on IV but unfortunately did not make it and the reality of the situation just hit me straight away. It broke our hearts...So many beautiful Galgos abandoned, in need and without these amazing people there would be no chance for them. Maybe Attilla did not make it but many others are now thriving at GEF shelter and for that my spirits were lifted. Later that day I met the two beautiful galgas who I was bringing back to New York. Laika a playful sweet girl and Dala who I met last October when Vera took me to the kill station to get two galgas out of there. One was Dala and how different she looked now! She had transformed from an emaciated limping little girl to a happy healthy playful galga with a funny nature now with a wonderful life ahead of her. It was so awesome to watch them run and play in this field before their long journey! On the Sunday after I arrived, Vera organized a special day for the shelter volunteers as well. They planned a walk with the shelter dogs on the beach in Torremolinos. What a production!! Getting all the dogs ready for their trip in the volunteers cars, who goes with who, which two dogs walk well together etc etc..finally we were off..OK the weather played a few tricks..rain and wind, but in the end the sun shined. I had to seek shelter in our car during the rain as I was coming down with a bug, but when the sun came out I walked with a beautiful galgo named Pino on the beach and we had a nice coffee together at a beachside café until the others caught up. We then met at Veras home for a lunch with the volunteers and a meeting about the shelter and procedures for the duties and proper daily maintenance..there were about 30 people in total..a wonderful engergetic and happy group of galgo and podenco lovers!! I sure felt at home!! With all the positive people now dedicated to helping Galgos en Familia, there is progress that I can see amongst the Spanish reaching out to their own, telling them about the atrocities that these sweet innocent hunting dogs endure at the hands of the hunters. 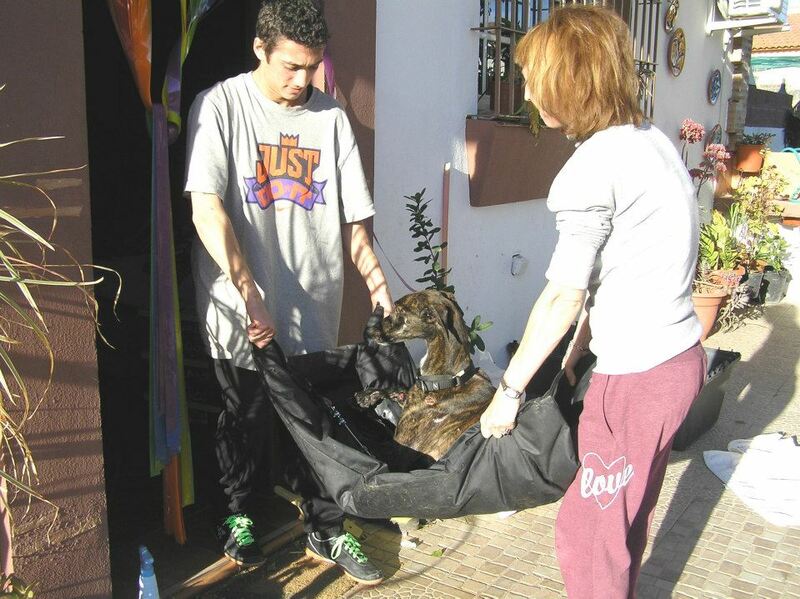 More and more dog lovers in Spain are reaching out to the galgos and the podencos. More adotptions within Spain and that is a start. Change is slow but there is change and that is the hope and what we work for. We can't save every life but we can change the life of those that are lucky enough to find their way to the shelters like Vera's Galgos en Familia! Visitors Welcomed!! PART II of my trip to Spain and the time I spent with 112Carlotagalgos coming soon. and PART III will be the anatomy of a transport. People often ask how it is all arranged so I will show with pictures how GRIN and others accomplish these crazy, complicated and rewarding transports to get a few dogs to the states! Stay tuned..
April 14-16th New Dogs Arrive!! APRIL 14th-16th GRIN SPRING TRANSPORTS ARRIVE SAFE IN THE U.S.A. Wanted to share the continuing good news of the Galgos and Podencos who have made it safely to U.S. shores this last week. GRIN Board Member Marylou Hecht and Sharron Thomas founder of Fast Friends Greyhound Rescue in NH braved a quick trip to Murcia/Madrid to bring back four Galgos and two Podencos and we are happy to say everyone is back safe and sound and 6 lucky dogs have begun their new lives secure and safe. 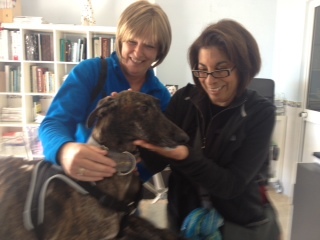 Marylou and Sharron visited with Galgos del Sol and Ibizan Hound Rescue in Murcia. They also visited the new charity shop run by Diane of IHR that helps raise funds for the dogs in their care. The dire situation in Murcia was shared with them and the reality of what these rescue groups face is overwhelming. Both Marylou and Sharron have come back again with a new energy to help these dedicated rescue friends in Spain anyway we can! On an upbeat, they were able to spend time playing with the podencos of IHR with the toys they brought for them, and cuddling some newly born podenco pups as well! They also visited a boarding facility run by a Dutch couple that helps IHR to board dogs until they are either fostered or homed. Time flew by and the whirlwind that started on a Thursday in Murcia culminated with the transport of 4 additional galgos from Galgo Connection Spain at Madrid Airport on the following Sunday. We thank IHR for the transport from Murcia it is always so nice to have them on board to help us at the airport!! Three of the Galgo from GCS, Bella, Troya and Vintage are under the care of Grateful Greyhounds in NY. Sharron Thomas adopted podenca Millie Mo from IHR as well as bringing a galga in need of rehabilitation for a hip and leg surgery she had, and GRIN brought over the Podenca Arlene for GRIN adopter Nancy Marble who adopted two other pods from us earlier this year, Kaleen and Manolo..
On April 16th - two more lucky doggies came on another whirlwind overnight transport from Madrid to JKF..thanks to Grateful Greyhound volunteer flight patron Don Baldwin who brought back GCS's Kiko and Mila the podenca two more are now safe!! Thanks also to George Knott and Scott Guttledge for helping us bring Kiko and Mila by sharing their AA miles with us!! Way to go guys!! Thanks Don and also thanks to Donna Terrusa for flying Kiko from JFK to Orlando this week! whew!! All the dogs are doing great and everyone is so happy that we were able to complete this transport into JFK..without any problems…just the regular exhaustion of taking on a transport like this! Thank you to everyone involved.. Here are the lucky dogs! 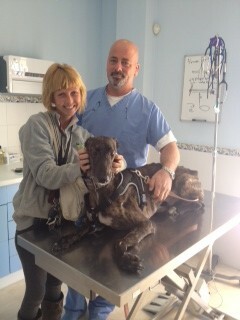 The galga Joanna was also rescued through Assoc. Argos and brought to Fast Friends as she needs rehabilitation.